When it comes to refrigerators, Whirlpool is a renowned brand among the users for several years. With its extensive range of double door refrigerators, Whirlpool is making our lives easier and gathering the consumer's trust worldwide. Whirlpool double door refrigerators come in different sizes, styles, and dimensions, which are the perfect combination of energy efficiency and storage space. They not only provide ample room for storage of fresh foods and drinks but also are light to your pocket. These top-rated Whirlpool double door fridges come in neutral shades of grey, silver, wine red that matches the aesthetics of your home. 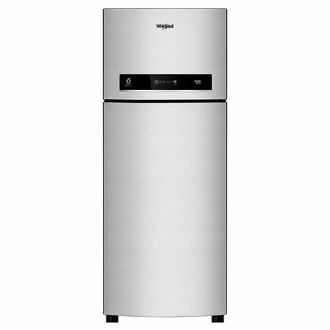 Whirlpool, while offering versatile, and premium feel refrigerators also see that they are remarkably affordable. Regarding the capacity, you get the options from 258 liters to as much as 702 litres. As they are rated with 3-star and 5-star by BEE, power consumption is on the lighter side. The frost-free double door refrigerators are available for purchase at various online stores. If you are ready to buy one, here is the price list of 49 Whirlpool double door refrigerators, whose prices are updated on 25th April 2019.